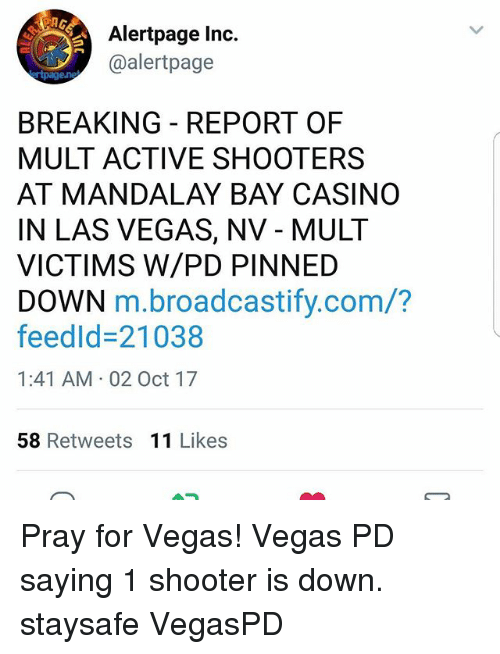 Las Vegas Shooting Survivor, Says Were 3-5 shooters, Several in Venue – Coercion Code – "Dark Times are upon us"
(INTELLIHUB) — AS reported by Shepard Ambellas one of last Sunday’s shooting victims Rocky Palermo who was shot in his pelvis told “The Blast” that after he had been shot he could tell that bullets were sweeping the venue from both elevated positions and from different trajectories horizontally and said that several other shooters were firing from inside the venue. I have now not been able to find the second video of a shooter on the 4th floor. There is not just a cover up, as the light went on the 22,000 that night, instead of off them. Now other anomalies have been found without end everyday, as we are becoming a free Republic under the states, Pentagon and Pres. Trump!